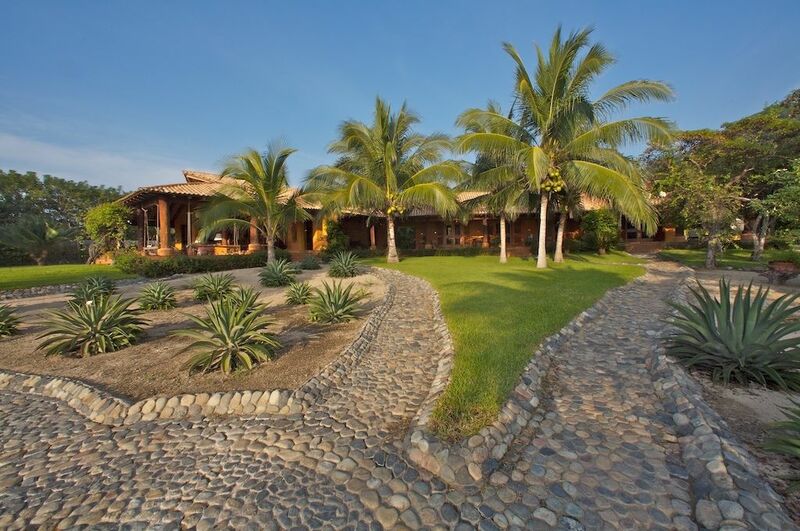 Las Tejas is a colonial hacienda-style home on 1½ acres (6000 m²) of beautifully landscaped beach front property. A perfect place to enjoy a relaxing vacation in tropical Mexico. We are located on the beach at Manzanillo Bay in Troncones, Mexico; just 30 minutes away from the resort area of Zihuatanejo-Ixtapa and 40 minutes from the international airport. Troncones is a small but growing ecological vacation resort known for its pristine beaches, surf and warm friendly people. This magnificent home has incomparable views of the Pacific Ocean and the majestic Sierra Madre del Sur mountains. Everywhere you look you will notice fine handcrafted details and old traditional Mexican charm. Ixtapa and Zihuatanejo offer a large variety of restaurants for all tastes and budgets; however, in Troncones we have a growing number of small restaurants so that even if you do not feel like cooking you do not have to leave our little paradise. The Cocina del Sol at the Hacienda Eden Hotel and the restaurant at the Inn at Manzanillo Bay and are located only a short walk down the beach. Many other local restaurants serve fresh local seafood as well as hamburgers, steaks, traditional Mexican fare and even pizzas. For a truly local experience you might want to try one of the taco stands located in the center of the village. And there are miles of beach with numerous tidal pools and other wonders to explore. If you are fortunate you may see a sea turtle laying eggs, or whales and dolphins jumping as they pass along our coast. If you need more action than watching the pelicans dive into the waves from your hammock in the shade of the palapa or sipping a margarita by the side of the swimming pool, there are plenty of activities to keep you busy in Troncones. The surfing is world class with a great break right at the point of our beach. The sport fishing is also world class especially for marlin and sailfish. There are two Robert Trent Jones designed golf courses 25 minutes away. Swimming, snorkeling, boogie boarding, horseback riding, yoga, bird watching, hiking, cave exploration, and mountain biking are all available in Troncones. Small 'panga' boats can be hired in the neighboring village of Majahua for local fishing or exploring the coast.